Very massive galaxy cluster RXCJ1131.9-1955 at redshift z = 0.306 in a very rich galaxy field with two major concentrations. It was originally found by George Abell and designated "Abell 1300". The image was obtained with the ESO/MPG 2.2-m telescope and the WFI camera at La Silla. Clusters of galaxies are very large building blocks of the Universe. These gigantic structures contain hundreds to thousands of galaxies and, less visible but equally interesting, an additional amount of "dark matter" whose origin still defies the astronomers, with a total mass of thousands of millions of millions times the mass of our Sun. The comparatively nearby Coma cluster, for example, contains thousands of galaxies and measures more than 20 million light-years across. Another well-known example is the Virgo cluster at a distance of about 50 million light-years, and still stretching over an angle of more than 10 degrees in the sky! Clusters of galaxies form in the densest regions of the Universe. As such, they perfectly trace the backbone of the large-scale structures in the Universe, in the same way that lighthouses trace a coastline. Studies of clusters of galaxies therefore tell us about the structure of the enormous space in which we live. Following this idea, a European team of astronomers , under the leadership of Hans Böhringer (MPE, Garching, Germany), Luigi Guzzo (INAF, Milano, Italy), Chris A. Collins (JMU, Liverpool), and Peter Schuecker (MPE, Garching) has embarked on a decade-long study of these gargantuan structures, trying to locate the most massive of clusters of galaxies. 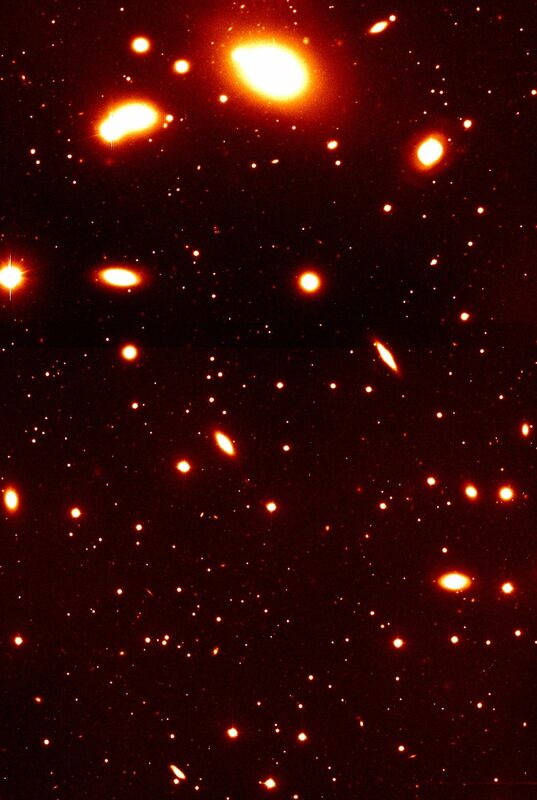 Since about one-fifth of the optically invisible mass of a cluster is in the form of a diffuse very hot gas with a temperature of the order of several tens of millions of degrees, clusters of galaxies produce powerful X-ray emission. They are therefore best discovered by means of X-ray satellites. For this fundamental study, the astronomers thus started by selecting candidate objects using data from the X-ray Sky Atlas compiled by the German ROSAT satellite survey mission. This was the beginning only - then followed a lot of tedious work: making the final identification of these objects in visible light and measuring the distance (i.e., redshift ) of the cluster candidates. The determination of the redshift was done by means of observations with several telescopes at the ESO La Silla Observatory in Chile, from 1992 to 1999. The brighter objects were observed with the ESO 1.5-m and the ESO/MPG 2.2-m telescopes, while for the more distant and fainter objects, the ESO 3.6-m telescope was used. Carried out at these telescopes, the 12 year-long programme is known to astronomers as the REFLEX (ROSAT-ESO Flux Limited X-ray) Cluster Survey. It has now been concluded with the publication of a unique catalogue with the characteristics of the 447 brightest X-ray clusters of galaxies in the southern sky. Among these, more than half the clusters were discovered during this survey.